The mere mention of an invitation to her candlelight suppers sent people fleeing, milk men tried to hire scouts to venture to her door rather than approach it themselves, and if you ever dared called her “Bucket” instead of “Bouquet” she could make your blood run cold with little more than the dreaded wince/withering stare combo. If she lived in Westeros, even Tywin Lannister would say, “screw this” and hand over the Iron Throne rather than listen to another story about her dear son Sheridan. The “she” in question is Hyacinth Bucket, the lady of the house and star of the wildly successful British sitcom Keeping Up Appearances (1990-1995). Keeping Up Appearances often treated Hyacinth, who was played by the great screen and stage actress Patricia Routledge, as if she were Godzilla with exquisite table manners and an impressive collection of hats. 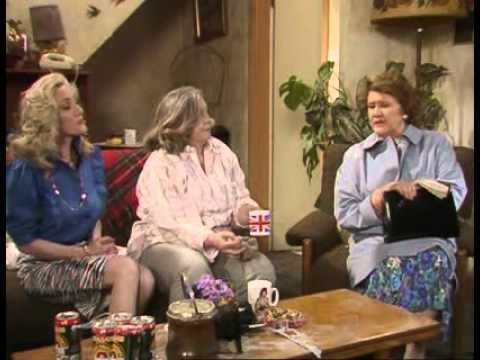 Hyacinth came from a lower class background, one that her sisters Rose (Shirley Stelfox, season one; Mary Millar, seasons two-five) and Daisy (Judy Cornwell) were living reminders of, and she spent nearly every episode dreaming up schemes to climb the social ladder. The sad truth is as outlandish as Hyacinth’s behavior seems, she is, at least to some degree, an accurate representation of the small section of the middle class that are both socially-obsessed and snobbish. Part of what made the series so entertaining is that, chances are, you’ve met a Hyacinth. 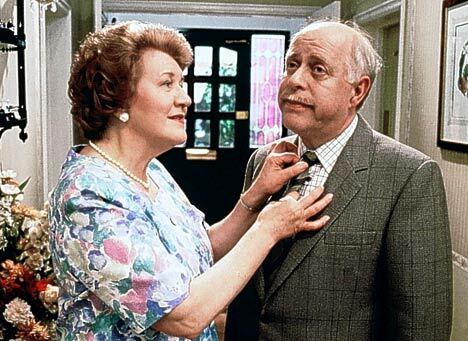 During the recession, the phrase “Hyacinth Bucket Syndrome” was floated to describe the refusal to downsize for fear of what the neighbors might think. Of course, Hyacinth’s behavior is in no way exclusive to her gender; there are plenty of male Hyacinths out there as well, and Hyacinth owes a great deal to at least one of them. Most of the women we’ve discussed prior to Hyacinth have been essentially likable characters, and while I believe it’s easy to admire Hyacinth’s headstrong nature (she may be totally oblivious, but you have to give her credit for her unwavering confidence), she is the first truly abrasive protagonist we’ve discussed. But there’s a fine line between abrasive and funny and she has her male counterpart Basil Fawlty (John Cleese) of the classic Fawlty Towers to thank for drawing that line in the comedic sand. Basil paved the way for Hyacinth to be as obliviously awful and pretentious as she possibly could be without speeding by hilarious into insufferable territory. The key difference between Hyacinth and Basil is that Basil had human foils. His wife Sybil (Prunella Scales) was always around to call him on his schemes to weed out the riff-raff and attract a more bourgeois clientele for his decrepit hotel, and in the 1979 episode “Waldorf Salad,” he meets his match in an easily outraged American. But Hyacinth? Hyacinth was too terrifying to illicit anything beyond whispers of “that Bucket woman” behind her back. What Hyacinth lacked in human foils, she more than made up for with her own foibles. Hyacinth’s grand schemes always went awry, creating situations where the series was most definitely asking us to laugh at her, rather than with her. Routledge was so gifted at physical comedy it is no wonder the writers found plenty of creative ways to orchestrate situations where Hyacinth would fall overboard from her “yacht” (in actuality it was a tiny boat) or become trapped in a compromising situation with her husband (see the classic scene in this 1993 interview with Judy Spiers). Hyacinth was an expert at backing herself into social corners she couldn’t wriggle her way out of, simply because she couldn’t be content with the lifestyle she had. It was the overreaching that always did her in. Hyacinth’s supposed acts of kindness were always covers for social advancement. In the season five outing “Skis,” she purchases Richard, who has no interest in skiing, a set of skis for his birthday and then forces him to parade them around town sticking out through the windows of their car, so the neighbors can see their affluence in all of its ski-shaped glory. The situation becomes even more ludicrous when they happen upon two elderly women Hyacinth would like to become closer to and Hyacinth insists that they allow her to give them a ride in the car, where they’re trapped by the skis, and then rather than taking them where they want to go, she takes them to see her wealthy sister Violet (“the one with a Mercedes, swimming pool, sauna, and room for a pony”—as well as a cross-dressing husband and a crumbling marriage, but Hyacinth tends to leave that bit out). It wasn’t until season five (in “A Barbeque at Violet’s”) that Richard snaps and yells at Hyacinth for provoking a man in a telephone booth. “Well done, sir. In war-time, you would have gotten a medal for courage like that,” the man tells Richard, but Richard’s outburst is a one-time only occurrence. 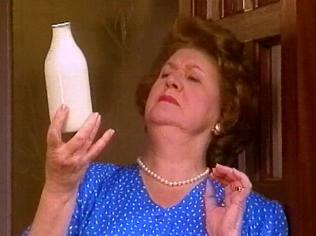 For five seasons, Hyacinth is allowed to blithely insult and rule over everyone she encounters. She is particularly nasty to her sisters and brother-in-law Onslow (Geoffrey Hughes) who often insists on speaking to her while wearing only a vest just to annoy her. Whenever Rose and Daisy show up at functions or at the Bucket house unexpectedly, Hyacinth either orders Richard to send them away or she does her best to usher them out of sight herself—a feat made all the more difficult by the trademark backfire of Onslow’s car that heralded their arrival. In her own way, Hyacinth did love her family, she just preferred for them to stay out of sight. Her interventions in Rose’s (whose love life was as legendary as her moody post-breakup dramatics) attention grabbing theatrics were admirable in a way. 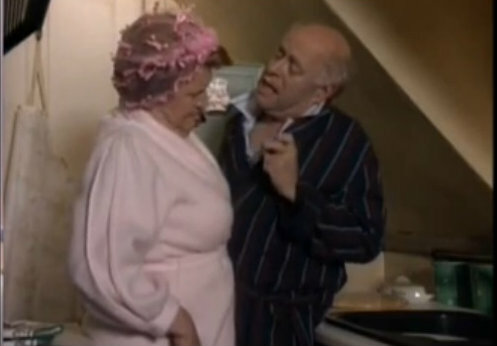 But Hyacinth’s most interesting familial relationship was the one she had with her senile Daddy. While she spoke fondly of her father, she never allowed him to move in with her and Richard, instead she left him in the care of Rose, Daisy, and Onslow. This led to a series of misadventures where Daddy would occasionally ride naked through the streets on his bicycle, collect horse manure for his chilblains, accost any and all women he encounter and have the occasional war-time flashback and stand guard at the door wearing a gas mask and carrying a bayonet (a situation only Hyacinth is daring enough to defuse). Of course, Hyacinth would always find a way to spin his behavior to come off as heroic or innocent, both to save face and to encourage her own delusions of her perfect lifestyle. Still, despite her many flaws and oppressive personality, Hyacinth is a trailblazer of sorts. Few female characters have ruled over their world with such a pristine-white gloved clad iron fist, and in an age when we prefer our protagonists to wallow in their worst features (paging Walter White and Don Draper), Hyacinth would fit right in– while proudly standing ten feet away from them with her head held high because she would never stand so close to a dirty meth dealer or a boozy ad man. After all, what would the neighbors think? Sabienna Bowman is a freelance writer and editorial manger at TV Equals. She is also a contributing writer at Film Equals and you can find her previous work at Wit & Fancy. Follow her on Twitter @sljbowman.